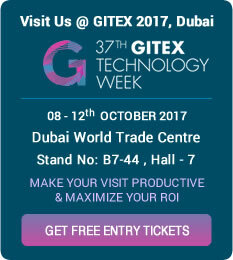 Every Year GITEX Technology Week attracts tech trend-setters, IT giants, and industry innovators from around the globe. ANGLER Technologies, a renowned India based IT Outsourcing company is glad to announce its participation at 37th Gitex Technology Week in Dubai next month for the 12th consecutive year. This year we will showcase our cutting edge products, technology expertise as well as establish connections with potential clients. Our active presence in this one-of-a-kind event helps us to interact with global IT leaders, teams, vendors, and business partners as well as sign strategic partnerships with Middle East market. To make us your offshore outsourcing partner Register with us online and get free tickets to meet us in person next month, between 8th – 12th Oct 2017 at Stall No: B7- 44. Your Visit to our stall will let you know the mindshare of ANGLER.